Library - St. Croix Sensory, Inc.
You can browse our library by selecting a subject below. Please feel free to contact our offices directly with questions. We are happy to help. The following document provides a brief explanation of these parameters of odors. We invite you to read our published papers and learn more about odors! Check out papers in the four categories below. McGinley, M.A., and McGinley, C.M. McGinley, C.M. and McGinley, M.A. McGinley, C.M., McGinley, D.L. and McGinley, M.A. McGinley, M.A., Mann, J.L., and McGinley, C.M. Fortune, A., Henningsen, S., Tuday, M., McGinley, M.A., and McGinley, C.M. McGinley, C.M. & McGinley, M.A. McGinley, C.M., and McGinley, M.A. McGinley, C.M., Mahin, T.D., and Pope, R.J.
McGinley, C.M., McGInley, D.L., and McGinley, K.J. A helpful list of existing sensory standards published by ASTM International. A helpful list of existing sensory standards published by various international standards organizations. ISO/IEC 17025:2005, General Requirements for the competency of testing and calibration laboratories. Below is a helpful list of other existing ISO sensory standards. A list of helpful sensory books. the Nasal Ranger after multiple press reports of its use in Denver. – This is a fun blast from the past. Unfortunately, the video quality is poor. But the introductory story is excellent! Jay R. Witherspoon & Jennifer L. Barnes, CH2M Hill, Inc.
Q: What is ASTM E679? ASTM E679 is an ASTM International standard method for determination of odor thresholds by a triangular forced-choice testing method. This standard was first published in 1979 as E679-79, when it replaced the static threshold “Syringe Method”, ASTM D1391. In 1991, minor revisions were made and the standard was renumbered E679-91. In 2004, additional examples were added to the standard and the newest revision is published as E679-04. This standard was reapproved in 2011. EN13725 is a Committee European Normalisation (CEN) standard method for “Determination of odour threshold by dynamic olfactometry.” EN13725 exceeds the requirements of ASTM E679 with additional QA/QC and assessor selection requirements. Q: What type of olfactometer does St. Croix Sensory use? At St. Croix Sensory, we utilize the AC’SCENT Olfactometer. We developed this olfactometer in the 1990’s to meet the newest requirements of ASTM E679 and EN13725. We run this olfactometer operating in Triangular Forced-Choice mode with a 20-LPM presentation rate. The AC’SCENT can also be operated in Binary Forced-Choice, Yes/No, or Direct Presentation testing modes. The AC’SCENT can also be operated at flow rates of 3-LPM to 20-LPM. Q: What are odor units? Odor units are a pseudo-dimension applied to odor threshold testing results from testing with an olfactometer. The olfactometer threshold result is a dimensionless dilution ratio. Frequently, the units of “odors units” (O.U.) or “odor units per cubic meter” (O.U./m3) are applied to the result. This dimensionless value refers to the average dilution ratio at the threshold or the number of dilutions needed to bring the odor to this threshold. Q: What is Odor Intensity? Odor intensity is determined following ASTM International E544, “Standard Practice for Referencing Suprathreshold Odor Intensity.” It is a measure of the perceived strength of the odor. Q: How long does it take to receive my results? For environmental odor evaluations, St. Croix Sensory provides a detailed electronic report within 5-business days after evaluation. In most cases, reports are received 2-3 days after evaluation. Fast guarantee report turn-around can be provided at an additional charge. 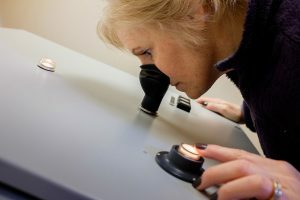 Q: Where do I get odor sampling equipment? St. Croix Sensory is a manufacturer and supplier of odor sampling equipment. Equipment is available for both rental and purchase. Please contact us for specific information about the equipment you may need. Q: How do I ship samples to St. Croix Sensory? All odor samples should be analyzed within an industry standard of 30-hours. This requires samples to be shipped to St. Croix Sensory via priority overnight shipping (e.g. UPS or FedEx). In some cases, early AM delivery may be necessary from some locations and depending on the time samples were collected. St. Croix Sensory provides shipping boxes at no charge (charge for shipping). These boxes can be sent directly to your sampling site for your convenience. Please contact us for specific information about shipping. Q: Does the VAC’SCENT Vacuum Chamber comply with the EPA sampling methods? Yes, EPA Method 18 – Measurement of Gaseous Organic Compound Emissions by Gas Chromatography and Method 0040 – Sampling of Principal Organic Hazardous Constituents from Combustion Sources Using Tedlar Bags. Q: When I sample, how do I minimize contamination between samples? Change or purge the Teflon sampling tubing after each sample collection. Q: Do I need a pump with the VAC’SCENT? No, the VAC’SCENT has a pump inside. However, if you need to collect a sample over a long period of time (10-minutes to 60-minutes) we recommend you use a variable speed personal sampling pump externally to create the vacuum inside the VAC’SCENT. Q: What sample tubing should I use? Teflon tubing should be used for collecting odor samples. St. Croix Sensory can provide 1/4″ Teflon tubing. Q: What are the ports on the vacuum chamber? There are four ports on the front of the chamber. Ports A & B (front left) are the integral pump outlet and inlet. Port C is a valved port for depressurizing the case. Port D is the sample inlet port. Connecting Port B to Port C will evacuate the air in the case. The sample will then flow into Port D, and then the sample bag, to balance the pressure. Q: What size sample bags will fit in the VAC’SCENT? The VAC’SCENT can be used to fill two 10-L sample bags at one time. This allows for collection of true duplicates. A 25-L bag can be used if the dimensions of the bag are appropriate. Please contact us if you have specific needs. The VAC’SCENT can be built with cases of varying sizes. Q: Does the AC’SCENT Flux Hood comply with EPA sampling methods? Q: When I use the Flux Hood, what flux gas/air do I use? The protocol for your project may dictate zero-air or high-purity nitrogen (HPN) with or without a helium (He) component. Q: What is the typical sweep gas (air) flow rate? 25-liters per minute per square meter is a typical sweep gas rate, which is 3.5-LPM for the 0.13-m2 under the AC’SCENT Flux Hood. Q: What is the typical sample collection rate? The Sample collection rate depends on your project protocol; a typical sample collection rate is 1 to 2 LPM. The Nasal Ranger may be purchased by contacting St. Croix Sensory directly, or contact an authorized Nasal Ranger representative. Email us for contact information for our international representatives. Q: How often do I need to change the odor filter cartridges? The life of the odor filter cartridge will depend on how often it is used and the strength of the odors that it is filtering. A reasonable rule-of-thumb is to replace the cartridge after 200-hrs of field use. Stronger odors may require more frequent replacement. Please see this video for additional information and demonstration of filter replacement.